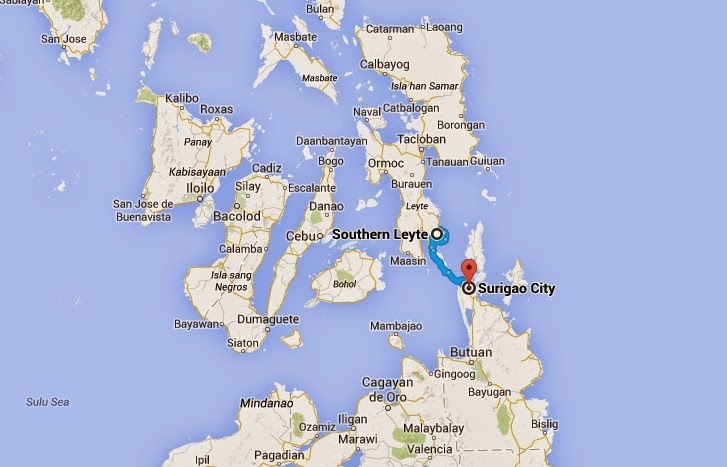 MANILA, Philippines - (September 14, 11:00 a.m. Update) A ferry carrying 68 passengers bound for Surigao City sank off Southern Leyte coast in the town of San Ricardo on Saturday night, September 13, 2014, reports said. Strong waves spawned by the southwest monsoon (Habagat) caused the Maharlika 2 to sink, Southern Leyte Governor Roger Mercado said. At 10:30 PM, Chief-mate Abapo of the ill-fated Maharlika 2 RORO Ferry reported to the Philippine Coast Guard (PCG) that between 3:30PM- 4:00 PM at 5 miles out from Balong-balong, water entered through the steering gears that caused the vessel to capsize. 68 passengers including 2 children and 31 crews were on-board. All were reported to be wearing lifejackets. The crew were able to deploy 4 lifeboats, only 18 people were rescued aboard M/V Lara Ventura (a foreign vessel) and St. Martin LPG Tanker also rescued 6 passenger and 6 crews. The Provincial Disaster Risk Reduction and Management Office (PDRRMO) confirmed that Maharlika 2 from the Liloan Ferry Terminal in Liloan, Southern Leyte, sent a distress call along Pintuyan-San Ricardo area. According to the PDRRMO, the captain issued an order to abandon ship. As of 11p.m. on Saturday, Mercado said the rescue team of the province and the Philippine Red Cross (PRC) are already on their way to the site. In a recent Twitter post of Governor Mercado, it was said that at least two people were reported killed while 104 were rescued. There was no travel advisory issued in Southern Leyte but the weather has not been good due to Southwest monsoon, according to the PDRRMO.